Each year on November 1st and 2nd in Mexico as well as in Guatemala, Honduras, El Salvador, people celebrate the Day of the Dead. This is a touching and at the same time joyous holiday when people remember their dead relatives and ancestors. They believe that the souls of the dead relatives and friends come these days to visit them, have meal with them and spend time with their loved ones. The tradition came from the Aztecs which celebrated this holiday all month praying, bringing sacrifices, and performing various rituals. They also believed that the skull, was not a symbol of death but of eternity. The first day is devoted to the souls of the dead children, which in Mexico are called “little angels ” and the second day to all dead adults. These days people create altars in the house where they put a lot of different food and drinks that their deceased relatives loved, mostly in the form of skeletons, skulls, coffins, as well as candles and flowers. Everything uses very bright colors and paints. There is also a carnival, fireworks, and people make ​​a special female figure dressed as skeletons. When they visit the cemeteries, they decorate the gravesides with ribbons, candles and flowers. A special place on the holiday table is Pan de Muerto or “Bread of the Dead”, which is decorated in the form of bones, crosses, and skulls. 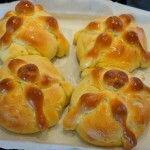 There are many varieties of this bread but it is usually round in shape, often with the addition of anise seeds and orange zest, strips of dough on top in the form of bones, and on top a round ball symbolizing the skull. 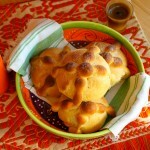 Brush the bread with melted butter and sprinkle sugar over them. Also you can do orange glaze or substitute sugar with powdered sugar. Mix the yeast with the warm water, add 1/ 3 tbsp of sifted flour, stir and leave in a warm place for 10 minutes. In a saucepan, warm the milk and butter over medium heat until butter is melted (do not boil!). Combine in a large mixing bowl the anise seeds, salt, and sugar. Turn the mixer on low speed and slowly mix in the warm milk and butter, add the yeast, orange extract and zest. Add eggs, one at a time, mixing through. Increase speed slightly and slowly add 1 cup of sifted flour, then turn off the blender. 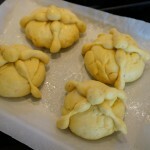 Divide the dough into five parts, and form four of them into smooth balls, the fifth part will be for the decorations. Lay a baking sheet with parchment paper, drizzle with the oil and lay out the four balls, leaving about 2 inches between each of them. Cover and let stay for 10 minutes in a warm place. Make decorations from the fifth piece of dough by pinch dividing this further into four smaller balls, about the size of large marbles. Divide the remaining dough into 8 pieces (~ 15 grams each) and roll them with your hands from the center out, making ropes that are slightly longer than the width of the loaves. As you’re rolling, press with your index and middle fingers and spread about 1 inch apart to make knobs that represent bones. 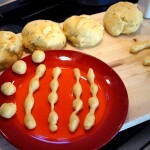 Next, arrange 2 of the rope bones on top of each bun, overlapping the ropes in the center, dab a little cold water on the top center of each round where the ropes meet and put the reserved dough balls on top, pressing slightly so they adhere(see photo). Preheat the oven to 180'C (350F) and cook for 25-30 minutes, until golden brown. 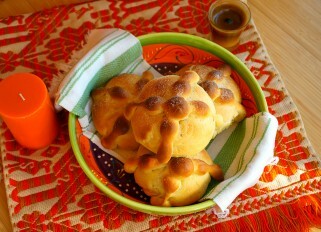 Brush each bun with the melted butter and sprinkle sugar on top.